Product #18265 | SKU LP36590 | 0.0 (no ratings yet) Thanks for your rating! The slate gray StreamLine 250 Shoulder Bag from Lowepro holds a mirrorless camera with an attached lens, an extra lens, and a 10" tablet. 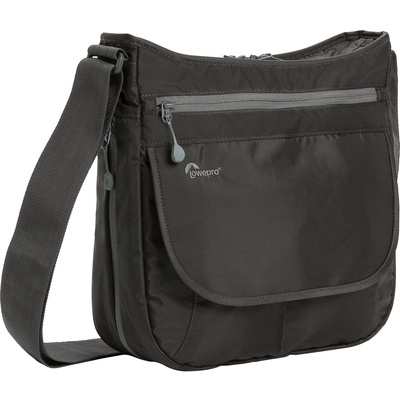 While designed to look like a traditional shoulder bag, the StreamLine 250 differs from traditional camera bags because its camera compartment is accessed from a zipper on the front of the bag. A seemingly flat zippered pocket on the front of the bag opens to reveal a concave area suitable for holding your camera. The inside of this compartment is separated by a padded divider, which allows you to store an extra lens. This design was created to prevent someone from reaching into your bag and stealing your camera and lenses. The bag's central compartment can be accessed from the top of the bag. This compartment can store general items or accessories and has a padded divider that provides you with space to hold a 10" tablet. If you need to make the whole compartment deeper, you can by unzipping the expansion zipper on the bottom exterior of the bag. For storing basic accessories, a front flap with touch fastener tabs lifts to reveal two slip pockets and a key leash. You can store your key chain and small photo items in these pockets. The backside of the bag provides a large open slip pocket as well as a small attachment hook for hanging the bag. The bag can be carried using the adjustable shoulder strap.